Graphic images carry more punch in convincing smokers to kick the habit, a new U.S. study said, which also showed that mere text warnings were no match to powerful representations of the numerous ill-effects of cigarette smoking. Researchers led by Dr James Thrasher of the University of Carolina in Columbia confirmed on their study of 1,000 individuals that “that pictures work better than text,” in terms of driving home the message that smoking leads to serious health conditions and even death. Mr Thrasher added that such findings are applicable not only in the United States but also in other countries including Australia, which this year is set to implement one of the strictest regulatory measures that the global tobacco industry will face. By December 2012, cigarette products being sold locally are legally required to come in drab packages, with the plain look to be complemented by imposing health warnings that occupy much of each pack’s total makeup. Rolling out this kind of policy is powerful enough to reduce any country’s incidence of smoking but more traction for such campaign will be gained if compelling images of people suffering from tobacco-related diseases are used, Mr Thrasher said. “Our research supports this finding while also showing what tobacco researchers have assumed for a while – that warnings with pictures work particularly well among smokers with low levels of literacy,” the lead author of the new report was quoted by USNews as saying. The report is set to be published by the American Journal of Preventive Medicine on December 2012, USNews said. According to Mr Thrasher, the findings that he and his co-researchers arrived at are especially true for smokers with low health literacy. The strongest indication that the study has reflected is that governments “should put prominent, graphic warnings on cigarette packages . . . (because) smoking is highest among people with the least education,” such as the case in the United States, Mr Thrasher stressed. Putting strong images along with specific health warnings “get people at least thinking about what the consequences of smoking cigarettes are. It gets them in the contemplation state,” Mr Satti told USNews. The German daily newspaper ‘Bild’ reported on Thursday that the European Commission has, after a lengthy time debating it, finally agreed to more graphic warnings on the labels of cigarette packages. One of nine new warning labels required by the FDA on all packs of cigarettes sold beginning in the fall of 2012. The labels that will become law in European Union countries will feature photos of damaged lungs and other parts of the human body that are affected by cigarette smoking; text surronding the photos will warn of the dangers of smoking in a stark manner. Other aspects of the changes being made in how countries will be dealing with cigarettes, Bild reported, include a banning of the word ‘light’ to describe any tobacco product and the end to allowing cigarette companies to use taste-enhancers in their cigarettes. The laws will also address the amount of packet space companies must devote to the images and text: fully 75 percent of the packets, on the front and back, must be given over to the graphic photos and text. Germany, which already has graphic warnings on cigarettes, will be one of the first countries to experience the new packets, Bild said. In the U.K. similar labelling already exists. Bild did not have an exact date for the new changes. The National Cancer Institute recently paid a glowing tribute to Health Minister Maithripala Sirisena for obtaining government approval to cover 80 percent of tobacco packaging with Pictorial Health Warnings (PHW). NIC Consultant and President Cancer Association, Dr. Samadhi Rajapaksa said 22 percent of the country’s annual health budget is spent on people who fall sick due to tobacco smoking. This figure is many times bigger than the amount the tobacco industry pays as annual tax to the government, he said. He further warned that 18,000 cancer patients are treated in the NCI every year for smoking complications. This is a good move by the government since internationally pictorial health warnings on tobacco product packaging are now been recognized as an effective and valid tool to inform smokers about the consequences of tobacco use. The International Tobacco Control Evaluation Project has studied tobacco-control policies around the world and it confirms the effectiveness of graphic images which incorporate vivid colour images. Vivid images, in particular, tend to elicit emotional reactions, which have been shown to be powerful motivators. World Health Organization Framework Convention on Tobacco Control (WHO /FCTC), is an international treaty that provides a global policy framework for Parties to implement strong measures against the death and disease caused by smoking. Article 11 of the FCTC contains provisions relevant to ‘Packaging and labelling of tobacco products’. Requirements include that countries ensure that each package of tobacco products carries pictorial health warnings that cover 50 percent or more of the principal display area but no less than 30 percent and are rotating; large, clear, visible and legible. As with the rest of the world, tobacco use is one of Sri Lanka’s leading causes of preventable death and disease. According to Dr. Samadhi Rajapaksa 18,000 cancer patients are treated in the NCI every year for smoking complications. Smoking is highly addictive and in a majority of cases, smokers become addicted during adolescence. Cigarettes and other tobacco products are harmful due to the presence of carcinogens (cancer-causing agents), nicotine (an addictive agent) and hundreds of other toxic substances. Tobacco smoke contains 69 known human carcinogens and numerous other chemical compounds that are highly likely to be classified as carcinogenic to humans. There is no risk-free level of exposure to tobacco smoke. Half of all lifetime smokers die early from smoking related diseases. Smokers have an increased risk of death or illness from numerous conditions, including heart and respiratory diseases and a number of cancers. Over the last decade there has also been a global trend towards bigger health warnings on tobacco packaging that includes graphic images. By now over 50 countries had finalised requirements for pictorial health warnings. For example, in 2005 Thailand switched to graphic labels, and the percentage of smokers who reported thinking about health risks because of the warnings increased from about 35 percent to 55 percent. The percentage of smokers who said that the warnings made them more likely to quit rose from 31 percent to 46 percent. During the same period, Malaysia had retained small text-box labels and there was no change in the effect of warnings on attitudes about health risks. The likelihood that warning labels might induce people to quit there actually went down slightly from 14 percent to nine percent. When Mauritius, introduced graphic warning labels the percentage of smokers who said they frequently noticed warnings on packages rose from 56 to 83 percent. Research also has revealed that with regard to pictorial warnings, more than half (55 percent) of EU citizens believe that adding a large colour picture to a text-only health warning strengthens the effectiveness of the text-only warning. This percentage is higher in United Kingdom (56 percent) where pictorials were introduced in 2008. Australia is another classic example demonstrating the effectiveness of pictorial health warnings. The country introduced the pictorial warnings in 2006. Two years later, the Australian government established a Preventative Health Taskforce, an expert group to examine the evidence on tobacco, alcohol and obesity, acknowledged extensive new evidence about the health effects of smoking that consumers have not yet been warned about, and also indicated that consumers need to be warned about all the risks posed by smoking in a clearer, more systemic and timelier manner. The report demonstrated that the graphic health warnings had achieved their intended purpose by increasing consumer knowledge of the health effects related to smoking, encouraging cessation of smoking and discouraging smoking uptake or relapse. The 2008 Evaluation indicated that the health warnings received strong support among consumers and public health experts, had achieved a high level of noticeability and gained widespread acceptance as believable. The significance and dominance of including graphic images was also reflected in the findings. However, smokers commented that the health warning on the front of packs was ‘too small’ and ‘too difficult to read’. Branding and use of colour on the packaging was thought to overpower the warning on the front of packs and the report indicated that some consumers were surprised that a greater amount of space was allotted to tobacco industry branding rather than the health warning. Consumers and public health experts made other suggestions for improvements including revising existing warnings with new images, updated text, more simplified and personalised messages, and changing layout and design. There were requests for increased variety in the types of messages with a range of suggestions for new topics. According to WHO Report on the global tobacco epidemic, although tobacco deaths rarely make headlines, tobacco kills one person every six seconds. Tobacco kills a third to half of all people who use it, on average l5 years prematurely. Today, tobacco use causes 1 in l0 deaths among adults worldwide – more than five million people a year. By 2030, unless urgent action is taken, tobacco’s annual death toll will rise to more than eight million. In Sri Lanka, this epidemic is getting serious and the people have suggested that an effective solution is needed in order to reduce the numbers of smokers and deaths. Presently, we have some approaches from campaign on awareness in television, billboard, newspapers, and magazines and to the uses of regulation or penalty to the smokers. The question here is, whether these approaches are effective enough to motivate the smokers to reduce or stop from smoking. The latest approach will be a good idea since health warnings are an extremely cost effective intervention and have immediate reach of smokers. Pack-a-day smokers will be exposed to the warnings over seven thousand times per year. This will exhibit to them to the risks involved in smoking each time they pull out a cigarette out of the pack. Policymakers should not rely solely upon large pictorial health warnings, which are designed primarily to inform consumers about smoking harms, to also reduce brand appeal. Other strategies are likely to be required. For example, Pictorial warnings in Canada and elsewhere also include supportive messages and concrete information on quitting. Research from health communication and ‘fear appeals’ indicate that the most effective messages are those that both warn and provide supportive ‘efficacy’ information. Indeed, large warnings that also include a toll-free telephone ‘helpline’ have dramatically increased the use of cessation services in places such as Australia, the United Kingdom, Brazil and the Netherland. As common citizens, we need to understand that smoking is not only an individual’s problem, but also a societal problem – “a social carcinogen,” as one prominent researcher characterized it. Also, it is a problem that cannot be left solely to government to solve. It will require the combined efforts of all of us to achieve a tobacco-free society. Produced by Lake House Copyright © 2006 – 2012 The Associated Newspapers of Ceylon Ltd. Please find the self explanatory information herewith showing the need for Government to amend current legislation to place the onus on all workplace licensees and managers to keep their premises smokefree or lose their licences to operate, to annually increase tobacco taxation to prevent youth smoking and to implement a display of tobacco products ban with tobacco products sold only in plain packaging, following Australia’s example. Meanwhile, sue Big Tobacco for the costs of treating the diseases caused by use of their consumer product as directed and enhance mandatory penalties against users and sellers of duty-not-paid tobacco. Results: In the Hong Kong population of 6.5 million in 1998, the annual value of direct medical costs, long term care and productivity loss was US$532 million for active smoking and US$156 million for passive smoking(total HK$ 5.366 billion) ; passive smoking accounted for 23% of the total costs. Adding the value of attributable lives lost brought the annual cost to US$9.4 billion (HK$ 73.32 billion). Conclusion: The health costs of tobacco use are high and represent a net loss to society. Passive smoking increases these costs by at least a quarter. This quantification of the costs of tobacco provides strong motivation for legislative action on smoke-free areas in the Asia Pacific Region and elsewhere. Hong Kong has a health problem. I’m not talking here about pollution, bad diets or the stress of living in such a crowded city, although they are all serious enough. I’m talking about a health funding problem. This year the city will spend around HK$100 billion on health care, or roughly 5 per cent of our gross domestic product. The government will foot much of the bill – around 46 per cent – from its tax revenues. A further 17 per cent will be covered by corporate health schemes and private insurance. And Hongkongers will pay the rest – some HK$37 billion – straight out of their pockets (see the first chart). At the moment people seem fairly satisfied with this arrangement. But it’s not sustainable in the longer term. In a new projection, analysts at reinsurance company Swiss Re have tried to work out how the city’s health care costs will change between now and 2020. They started by looking at Hong Kong’s expected economic growth, the growth in our population, and the relatively high rate of inflation for medical services (see the second chart). As a result, they estimated that the city’s health care costs will almost double by 2020. Then they assumed that the government will keep a tight rein on its health care budget – already 17 per cent of recurrent expenditure – holding spending steady at 2.3 per cent of GDP. And for good measure they assumed that the level of corporate and private coverage will also remain the same relative to GDP. 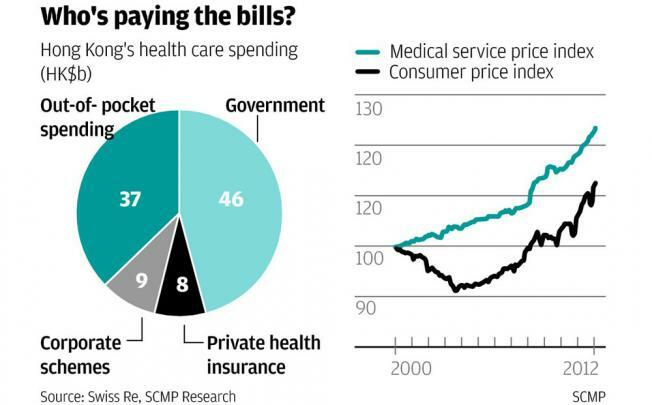 Given those assumptions, they concluded that the cost of medical services Hongkongers will have to meet from their own pockets will surge from HK$37 billion this year to HK$77 billion in 2020 (in current Hong Kong dollar terms). That’s a real increase of 108 per cent in out-of-pocket health care expenses. If anything, Swiss Re’s projection is likely to be an underestimate. Between now and 2020, the number of Hongkongers aged 60 and above is likely to rise from 1.4 million to 2 million. More elderly means greater spending on medical services. And because health care isn’t easily tradeable, the extra demand will naturally push up prices at an even faster rate, further increasing the city’s health costs. Of course Swiss Re has conducted its study because it wants more people to buy private health insurance. But there are problems with private insurance. For one thing, insurance companies prefer to sell policies to the young and healthy, who are less likely to run up heavy bills. For the old and frail, health policies can be ruinously expensive, or simply unavailable. Secondly, experience in other markets has shown that private health insurance programmes tend to lead to massive cost escalation. That can mean policies cover less and less as time goes on, leaving the policy-holders still facing heavy out-of-pocket expenses. And of course, private health insurance is simply too expensive for many people, pricing the poor out of the health care market. That means private health insurance is never going to be the sole solution to Hong Kong’s health care funding gap. Tax-funded government spending can’t fill the hole either. Rising health costs would soon begin to crowd out spending in other sectors like education and welfare. The solution will have to reside in some form of stand-alone social health insurance fund to which everyone of working age contributes, with the rich subsidising the poor, the healthy subsidising the sick, and the young subsidising the elderly. But the government had better get its skates on and set it up soon, or before long the city’s people will find themselves seriously out of pocket. 13 Dec 2012. Graphic warnings covering 75 per cent of the front and back of cigarette packs and bans on slims and flavours will be proposed by the European Union Commission, according to a report in the German tabloid Bild. EU Commissioners are preparing to announce proposals for a general revision of the Tobacco Products Directive. The newspaper did not cite a source for its report, nor say when the Commission will make their proposal public. An additive ban would include colours, vitamins, caffeine and the acid taurine, Bild reported. It was unclear from the article whether the proposed EU ban would include menthol. Commissioners plan to recommend banning cigarettes narrower than the standard 7.5mm width, according to Bild. Setting aside 75 per cent on the two faces would drastically reduce space for branding and place the 27 EU members among countries with the most space devoted to warnings. Currently warnings are a national concern. Two EU countries with large warnings are Belgium, with 48 per cent of the front and 63 per cent of the back, and Ireland (45 per cent/58 per cent). The Plain truth : how tobacco plain packaging will save live. Barely two weeks only into effect and Australia’s tobacco plain packaging law will face an acid test of effectiveness and authority once a stickers marketing company launches its wraparound stickers for cigarette packs. Anthony Do Rozario, general manager of Box Wrap, a sticker manufacturing company, said they created the wraparound stickers based on smokers’ perceptions that their self-rights had been disrespected by the law. “People feel they have had their choice ripped off them,” Mr Do Rozario said. Australia’s tobacco plain packaging law, which took effect on December 1, mandated that packages or boxes of tobacco, regardless of brand or manufacturer, must be packed in plain olive green, as well as contain visible health warnings without individual trademarks. Based at Yatala, the Gold Coast company’s drastic innovation has been regarded by many as a complete disregard to the existing law. “We are just a sticker company that is no different from a cigarette case,” Mr Do Rozario said. The Australian Medical Association (AMA) has urged on the Australian federal government to immediately put a stop to the company and its marketing blitz because its end goal is to hide the health warnings on tobacco boxes, which runs against the law’s very purpose which is to educate the people of the ill effects of smoking. “Those graphic health warnings are there for a very important reason. Over a million Australians have died because they smoked, but I think covering up those health warnings, I think the Federal Government is going to act very quickly and ban those products,” Steve Hambleton, AMA president, said. Federal Health Minister Tanya Plibersek, for her part, said she believed the law is effective. “The fact they’re making the stickers proves what we’re doing with the tobacco plain packaging law is effective,” she told reporters in Melbourne on Wednesday. Still, she said she has asked lawyers to investigate if the manufacture and sale of the stickers breach the tobacco plain packaging laws. “I think it’s important for Australians to have freedom of choice,” Mr Do Rozario argued. But such arguments circumvent the plain packaging legislation. “It’s there for a very good reason. We believe it will decrease smoking rates in Australia by another notch so we don’t want to see anything that can actually get around this legislation,” Dr Hambleton said. Mr Do Rozario said a packet of their stickers will be sold in their online shop for $8.75. Plans to expand them physically for sale in shops by early 2013 are underway. MANILA, Philippines – British American Tobacco, maker of Lucky Strike cigarettes is pushing through with its plan to invest $200 million in the Philippines over the next five years following Congress’ approval of the sin tax reform measure. BAT warned in July that it would pull out of its investment plan if the Aquino administration fails to pass the measure. “We will not pour the money in until excise reform is done,” BAT Philippines general manager James Michael Lafferty said in July. “In light of these latest developments, and in anticipation of President Aquino signing the bill soon, we confirm that we are investing at minimum $200 million over the next five years. We are looking forward to competing in the market and contributing to the growth of the Philippine economy,” BAT said in a statement. The money would be used to expand its presence in the Philippines, possibly through the construction of a manufacturing plant, Lafferty earlier said. The cigarette company expressed its gratitude to the Executive Department and Congress in reforming the country’s sin tax regime after 16 years. “BAT salutes the wisdom and courage of the Executive Department and Congress in taking the bold step of reforming the Sin Tax Law after 16 years,” the company said. It believes that the new law will be beneficial to the Philippines for the additional revenues it will generate for the health sector. “We believe that contrary to the predictions of doomsayers, this new law will be beneficial to the country for the additional revenues it will generate for funding its social programs and to the tobacco industry where players can now compete on a level playing field,” it said. BAT pulled out of the local market in 2009 because it said the local cigarette industry was not a level playing field. Under the current system, 1996 brands, which cover the brands of Fortune Tobacco, are permanently classified regardless of an increase in net retail prices but post-1996 brands are classified based on current retail prices. Now, with the passage of a new sin tax law, BAT said it is looking forward to a level playing field. “It can – and we are confident it will — open up expanded opportunities for the industry stakeholders, not only the manufacturers but distributors, retailers, employees and the tobacco farmers,” BAT said. Congress ratified on Tuesday a new sin tax measure that would effectively raise the prices of cigarettes and alcohol. OLYMPIA, Wash., Dec. 12, 2012 /PRNewswire-US Newswire/ — The number of Washington retailers illegally selling tobacco to minors has risen to its highest level in more than a decade. An annual report that tracks illegal sales shows about 16 percent of tobacco retailers in our state sold tobacco to minors from January to June of this year — up from 11 percent in 2011 and 10 percent in 2010. The Department of Health works with state and local agencies to train tobacco retailers so they know and understand their obligations under the law and the penalties for violating it. The high level of employee turnover in stores that sell tobacco makes retailer education crucial. With limited budgets over the last few years, local communities were unable to expand retailer education or dedicate resources to youth prevention. Meanwhile, the tobacco industry continues to invest huge amounts of money to attract new smokers. In 2010, the industry spent about US$80 million on marketing activities in Washington alone. The current youth smoking rate in Washington is about 13 percent. It’s dropped by about half since 2000. Unfortunately the rate of decline has leveled off in recent years, and the use of alternative tobacco products like chew, cigars, and hookahs is a growing concern. The rate of stores selling tobacco to minors is monitored in the annual Synar Report. The report is the result of federal legislation that requires states to enact and enforce laws that prohibit the sale of tobacco products to minors, and to conduct annual random, unannounced inspections of retailers. The report is compiled by the Substance Abuse and Mental Health Services Administration (SAMHSA). Compliance checks are conducted by local health agencies and the state Liquor Control Board. Working with local law enforcement, teens try to buy cigarettes and other tobacco products at randomly selected retailers. Clerks who sell tobacco to minors can be fined up to $100 and retail owners can be fined up to US$1,500. Licenses to sell tobacco are permanently revoked after multiple violations. If the rate of retailers selling tobacco to minors exceeds 20 percent, Washington could lose nearly US$14 million dollars in federal funding for drug, alcohol, and tobacco prevention and treatment. While official youth checks determine the rate of illegal sales, anyone can report a violation on the state Liquor Control Board’s website. Washington has made significant headway in lowering smoking rates, but there’s still work to do. Statewide there are about 70,000 youth who still smoke cigarettes. About 50 young people start smoking each day and about 7,900 people die every year in Washington from tobacco-related diseases. Making sure stores don’t sell tobacco to children helps kids remain free from addiction, disease, and death caused by smoking. Statistically, Hong Kong stands a chance of being the world’s first city to be declared smoke-free, which is defined as having less than 5 per cent of the population smoking. With only an estimated 11 to 12 per cent of people over 15 smoking, we already have the lowest rate in the Asia-Pacific region and what would appear to be the best among developed societies. But the world is watching to see if Australia snatches the smoke-free title from under our noses. On December 1 a law forcing tobacco firms to sell cigarettes in identical plain, drab packets featuring graphic health warnings came into effect in Australia in an effort to strip away any fashion or glamour and discourage young people from taking up the habit. The government pressed ahead with the new law, the first of its kind anywhere, after it was upheld by the country’s top court. This despite continuing legal challenges and threats by the tobacco industry over claimed infringement of its intellectual rights and unfair restriction of trade. The lure is the potential saving of 15,000 lives lost to smoking-related diseases each year, and A$31.5 billion (HK$262.86 billion) annually in related healthcare costs and lost productivity. What is Hong Kong waiting for in following suit? Our indoor no-smoking regime is plagued by defiance, weak enforcement and poor law drafting, which does not hold managers and owners of bars, discos and the like liable for breaches of the law. That our smoking levels are so low is thanks to three decades of campaigning by anti-tobacco lobbyists, government education campaigns, indoor bans and tax increases that have hurt smokers badly in the pocket for the sake of their health. But it is still not uncommon to see smoking in some pubs, nightclubs and karaoke bars. Busy shopping districts are prone to pollution by the cigarette smoke of tourists, particularly those from the mainland. Overseas studies show that children remain easily influenced by the behaviour of their parents and peers. Do we really need to wait and see how the Australian initiative turns out before considering further measures?